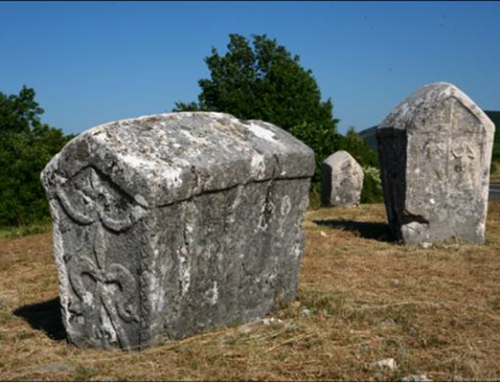 The necropolis is located near the village of Dubravka in Konavle in the vicinity of the borders of Croatia, Montenegro and Bosnia and Herzegovina. Apart from the graveyard with stećci, the site includes the church of sv. Barbara built in 1889 at the site of an older church. It is enclosed by dry stone with a prehistoric cairn (tumulus) next to it. There are two entrances to the graveyard with two medieval tombstones at each entrance. A road used to pass right next to the graveyard to connect inner Herzegovina with the Konavle valley. It had been in use from prehistoric times to the late Middle Ages. The necropolis has 104 stećak tombstones. Two types of stećci dominate: chests and slabs. Ornaments include motifs of stylized vines, rosettes and crosses, bow and arrow, arm and hand. No inscriptions were recorded. The site has been developing almost continually since prehistoric times. It is a complex archaeological site with several development stages. 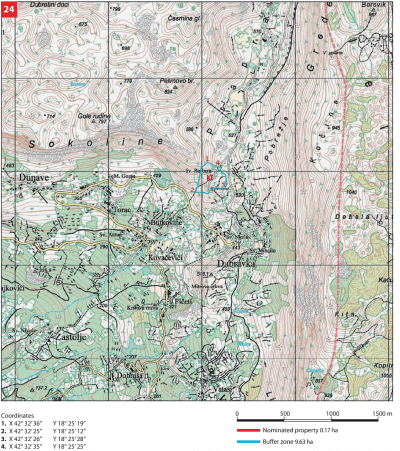 There used to be a road over the pass which played a major role in the emergence and development of the site. That was the east road of two major roads linking the coast and Konavle with the hinterland and Herzegovina. During the prehistoric time (Bronze Age) several tumuli (mounds) were created of which one was preserved within this site. We assume that the road was used in antiquity as well. 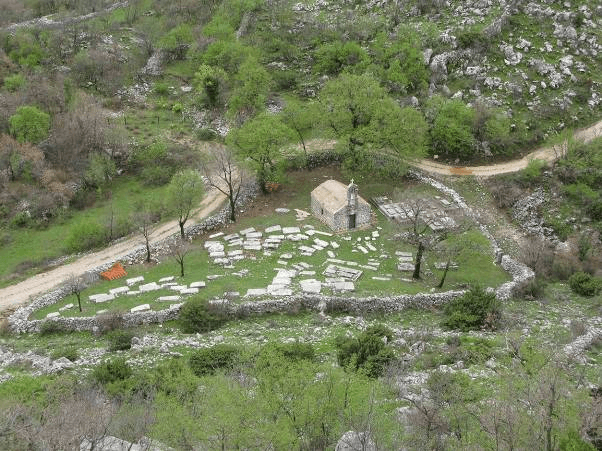 During the 14th and 15th century, the largest Konavle cemetery with stećci was built along the road (at the time probably called Kneževa ulica –Rector’s Street). 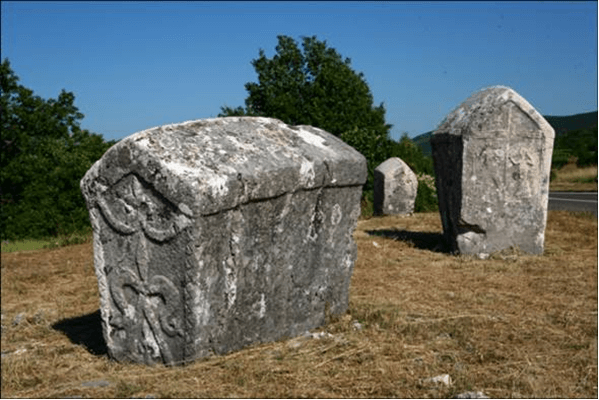 By the first decades of the 15th century, Konavle had been part of Zahumlje, more precisely Hum. From the second half of the 14th century, it was part of the Bosnian kingdom. Initially, Konavle had been governed by the noble family Sankovićes, and was later divided between the Pavlovićes and Hranić-Kosačas. In the period from 1419 to 1426, the Dubrovnik Republic bought Konavle, piece by piece, from the Sandalj Hranić family and the Pavlovićes and the area became an integral part to the Republic. Sokol, a nearby fortification, became the main military base of Konavle (Dubrovnik) and the Prince of Konavle moved to Pridvorje. The original church of sv. Barbara had been probably built in the Middle Ages whereas the existing church dates from 1899. Burials on the site continued in later periods, especially from the end of the 19th the second half of the 20th century. However, it did not have a significant impact on the older (mediaeval) part of the cemetery and to some extent there were even adjustments in terms of choice of materials and decorations on the tombstones. The immediate vicinity of the site is used exclusively for agriculture. Specifically, the area north and east of the cemetery was parcelled and fenced by dry stone. In the recent decades, it has been used for farming, while the mountainous part west of the church and cemetery has been exploited as a cattle grazing pasture. 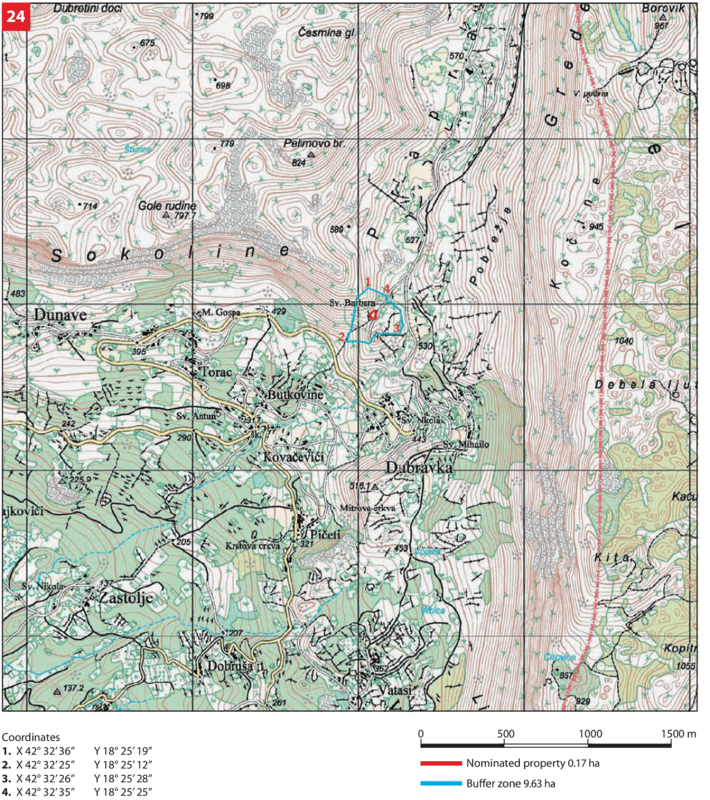 At the southern edge of the buffer zone, there is a 19th century military facility (probably built in the place of the earlier military facility) given that the site is located in the border zone where the vital communications are monitored. Similar facilities are also located on the surrounding hills. At the end of the 19th century, the site gets its current appearance. In mid-1900, minor archaeological research was carried out at the site. On that occasion, three graves beneath the tombstone north of the church were explored. There were no other findings except for the skeletons of the deceased. Some graves have been used repeatedly over a long period of time. 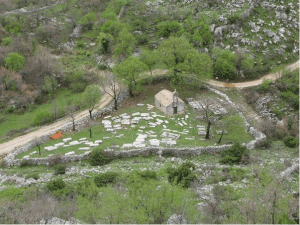 The site includes stećci within dry stone surrounding the church and the graveyard, a prehistoric tumulus and plots of land right next to the central part of the site. The state of conservation of the site is satisfactory. Judging by their arrangement, most of the stećci have been preserved in situ. A recording of the present state was made for this site as well. The recording is integral part to the report on the state of the site based on which further procedures aimed at its preservation and reconstruction are determined. This primarily includes prevention of the impact of various aggressive factors on the stećci, i.e. stone surface (water, ice, moss, lichen). 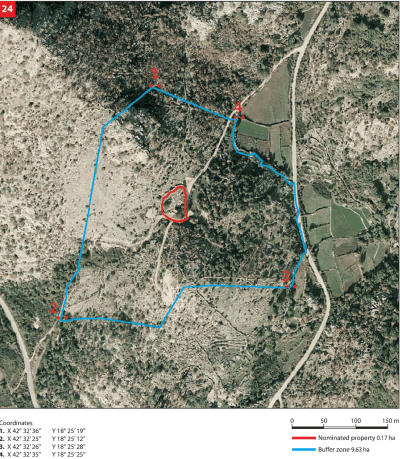 During 2013, activity on conservation and restoration analyses and examination of the state of certain stećci, i.e. of the state of the stone itself, as well as minimal conservation works began. 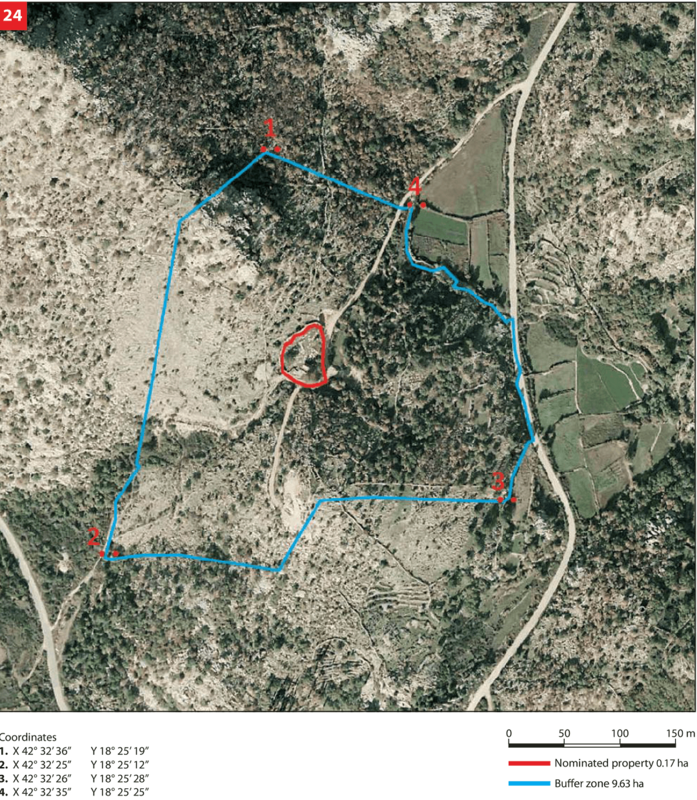 Reconstruction of collapsed parts of dry stone surrounding the central part of the site and dry stone within the so-called buffer zone is also planned. Reconstruction of sv. Barbara church, which shall be done by the Conservation Department in Dubrovnik, is a special conservation task. However, it is a relatively simple and quickly feasible conservation work. The abandoned and partially collapsed military facility at the southern edge of the buffer zone is also planned for reconstruction and future use as a centre for visitors, given its view towards the central part of the site and the entire surrounding area, which is important for understanding the creation and development of the site. There are no data available on the number of visitors of this site or the wider area and, due to its location, this nominated site is rarely visited by tourists. Although the number of tourists in the immediate area is extremely high, there is no significant pressure on this site and it is therefore not endangered. There is no info board or any other similar service for visitors at the site although installation of one info board was foreseen in 2014. There is no visitors’ reception centre and no parking lot. There is a need to establish one at the beginning of the access road. There is no sanitary facility at the site. In the immediate vicinity (within 30 km) there are several restaurants and shops while accommodation capacities are satisfactory in both private and public sectors, especially with regard to the proximity of Cavtat and Dubrovnik with a number of big hotels. The Rescue Service of the Republic of Croatia is very well organised through the National Protection and Rescue Directorate and a single phone line 112 as well as numerous local „units“ (Croatian Mountain Rescue Service, local health centres and clinics, police stations, fire departments and units). There are several such organisational units in the immediate surrounding area (Volunteer Fire Brigade Dubravka, Health Centre Dubrovnik-Cavtat, Health Centre Dubrovnik-Gruda, Police Station Gruda).